So this is on my list after I finish Age of Myth by M.J. Sullivan. Anyone else reading this? The book made my short-short list two nights ago as my Audible.com credit came up. But as I'm not at all familiar with Ryan I ended up going nonfiction and yet another book on dinosaurs, The Tyrannosaur Chronicles by David Hone. Everything you wanted to know, and more about T-Rex. An 8.5 hour book, all about that most celebrated of dinosaurs. I'm waiting for some reviews first. The ending of the Raven's Shadow trilogy was such a let-down for me that I don't really trust the author anymore. Im about 100/600 pages in, and its ok for now. Better writing than the sequels to blood song for sure. As somebody who enjoyed The Raven Shadow series thoroughly, I think I'm gonna probably like this. So full disclosure, I'm a fan of his writing style and storytelling. I'm hoping this new series will be just as rewarding to me as a reader. I'm going to read a bit today, yesterday I only got to the prologue. And what I can tell you from that one chapter is that Ryan is again using a similar kind of storytelling method as before. In Raven's Shadow he used Verniers' account to re-tell the story indirectly. I forgot now what Vernier was using (letters, memoir or something else). 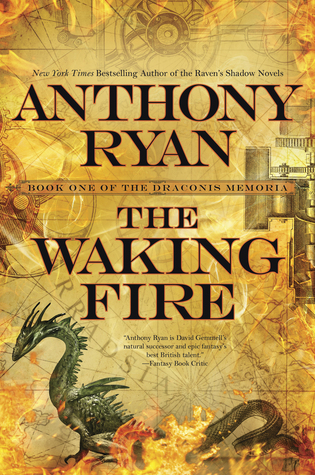 Well in The Waking Fire, Ryan is doing something similar. The story is being told through a company report made by someone who I'm assuming will take a similar position as Vernier in the overall story. More from me as I will be reading this book this week. Thanks Alucard. I look forward to your findings. I really liked Blood Song and Tower Lord, but for me Queen of Fire was a huge let-down. If this new book is anywhere near the quality of Blood Song though I do want to give it a read. There's two story arcs, written much like Tower Lord and Queen of Fire. But the upside is, that we're not left hanging waiting to discover what happens to Vaelyn Al Sorna. I only really found the arc of one of the main characters exciting, but the writing is infinately better than TL and QoF imo. It's no Blood Song to me, but it's a good enough book that I will finish the series for sure. The one big shortcoming to me, is that half the book could have easily been left out. The writing is more Blood Song than QoF, and that's a good thing in my eyes. The magic system is cool, very much Mistborn-esque. I give the book a 6.5/10 or maybe 7/10. There's a bit too much deus ex machina in his books, and this one too. And I think Ryan has a tendency to write characters he's too much in love with. Too good at everything they do. I liked this one. I enjoyed the book more near the start and found myself a bit impatient to get to the end, but overall a good, solid read with an interesting magic system that's very reminiscent of Mistborn. If anything, I think the author was too inspired by Mistborn. I found myself a bit annoyed at the characters, who (especially the female spies) were ridiculously overpowered. A decent amount of world building -- I liked how it combined the swashbucking, lost worlds, Horatio hornblower, and treasure hunting genres all into one big dragon infested epic fantasy. The pacing and plot was a bit choppy (how Clay goes from a sort of Night Angel empowered existence to sudden treasure hunter in the wild), but a lot does happen between the two covers. If anything, maybe too much happens with characters wandering around all over the place. This one was more about the journey through strange lands more than anything. I was mostly bored of the characters; they were cookie cutter mostly and insipid. No real personalities or depth. The author does a good attempt at making the women powerful and important. I found the actual writing itself was pretty good, but the well structured phrases couldn't save the bland characters. 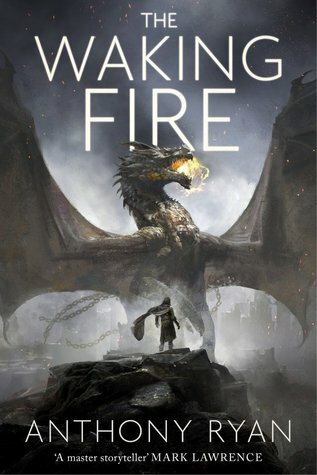 Like most of you here, I agree it's nothing on Blood Song, but it's a decent start to a new epic fantasy. 6.5/10 (or if I'm being generous, 7/10) for this one. At the end of the day, I did finish the novel which is more than I can say for most fantasy books I seem to start. So it was good enough for that, though I was eager to get the story done with about half way through. I've put this one on hold. Read around 20% and just couldn't get into it. I don't care about any of the characters, the whole story goes around way too much, and the pace basically suffocated any interests I had in the beginning. I will probably finish it, but I don't see that happening any time soon. And I was so pumped for a new Ryan series, because I loved the Raven's Shadow so much....this was just bland and boring. Dude I'm in the same boat!! With the build-up of two great characters vaylin and frentis, it was very much a let down. Now while waking fire sounds good, I'm gonna hold off for reviews. At 35% and this might be the best book I have read. As great for me as Blood Song was. No, it's even better. There is so much happening. Everything is perfect. Too short though. I'm glad I waited until it went on sale because I only have to wait until June for the sequel that I just pre-ordered. Finished it a few days ago, as I was detoured by a sci-fi book. It's not the best book I've read but it's in the top 25. Original, fast-paced, occasionally predictable as the protags get saved by the drakes (not dragons) over and over, even though they are enemies, with the humans supposedly on the brink of driving the drakes to extinction as a thank you. Main mechanism for everything that happens is the dramatic effects the blood of the drakes impart to the humans who are the 1-in-a-thousand "Blood Blessed" lucky folks. They gain superhuman talents upon imbibing specially prepared concoctions based on the bloods of the Green, Red, Blue and Black colored drakes. The search for the fabled white drake drives the narrative which includes wars, pirates, James Bond-like superagents including a Q-like genius, impenetrable jungles containing mysterious ancient cities, and generally nature striking back in a massive way. Lots of action, occurring during an industrial revolution-like timeline, and featuring battles between humans vs indigenous fauna and malformed humans. Decent characterizations, awesome unique world building that is loads of fun, and just a hint or two of the vastly bigger story being played out here. This is a thrill a minute action book if you like that. I do.